"Scary ba talaga? (Is it really scary?)" This is how our friends get our opinion on a horror or suspense movie we just watched. The possibility of them watching the movie, would oftentimes depend on the number of affirmative responses they can collect. It seems like we will be hearing this question more often as we see a parade of local horror movies being released recently. ABS-CBN's "indie" arm Skylight Films is in fact, releasing the second horror/ suspense movie of the three films they produced this year. After "Corazon, Ang Unang Aswang", the production line is set to release "Amorosa: The Revenge" in cinemas nationwide on August 29. During the movie's bloggers conference held at Wangfu Restaurant in Tomas Morato, Quezon City last August 22, it was the bloggers turn to ask the actors the question. "How scary is Amorosa?" Enrique Gil, who will be playing Rommel, Angel Aquino's other son in the movie, admitted that he doesn't get easily frightened. "Hindi talaga ako matakutin eh but the mood of our location alone for me is scary. It was raining hard and it was foggy, so nakakatakot siya talaga location pa lang", Enrique said. The movie is shot in Tanay, Rizal during the weeks when Metro Manila and its neighboring towns are experiencing non-stop rain. 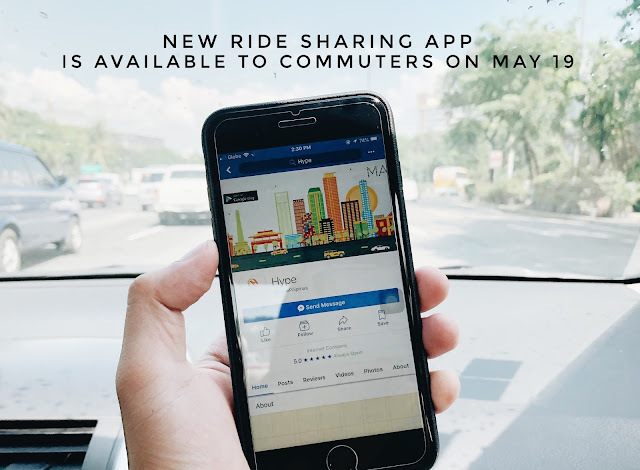 "Bumabaha na sa Manila. Kami, tuloy pa rin sa shooting", the movie's director Topel Lee said. 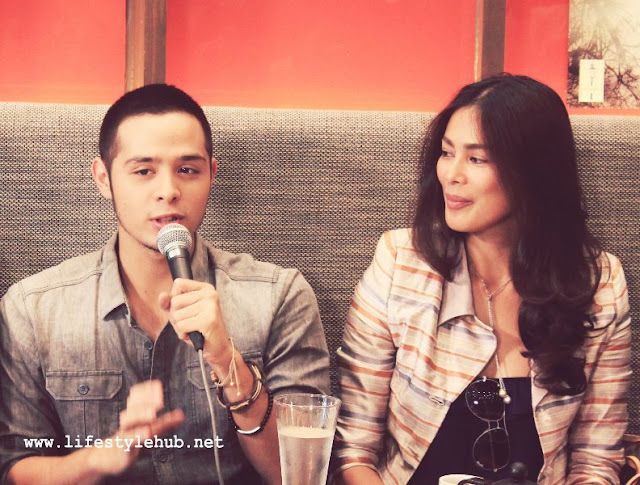 Portraying the role as Angel's second son Amiel, Martin del Rosario, on the other hand that he is very reactive to frightening objects. "Ayoko ng dolls. Ayoko talaga kasi parang nakakatakot sila. Sa movie 'to naman, prosthetics pa lang, nakakatakot na", the young actor said. Appearing in 2 successive horror films with "The Healing" just recently released, Martin doesn't mind though doing horror suspense movies. For the lead actress meanwhile, portraying Rosa came as a challenge. "I thought I would go through the role easily because the role is close to me- having two kids and the other one is ailing but it appears to be very challenging", she said. "Amorosa" is Angel's second lead role after appearing in another indie film "Donsol" in 2006 but she is still feeling the pressure. "It just feels so different- more demanding. While we were shooting, it seemed like in every scene the pressure was on me", Aquino shared. "Amorosa: The Revenge" is labeled as a different horror movie, Star Cinema's Enrico Santos emphasized, as the movie's plot is mounted on a family and their relationship. "It will be the most twist-filled family movie you will ever see", Santos pointed. In the movie, Rosa and her two kids were struck by tragedy and decided to move on by relocating to a new home. But more troubles began when they moved to their new residence. Topel Lee, a skilled cinematographer before he branched out to be a renowned filmmaker, promised more scare factor in the movie when he declared that he used special techniques to make scenes more convincing. "Definitely, I used special techniques like the emphasis on the fog and the lighting para mas maging effective 'yung scary plot ng pelikula", the director explained. Aside from Angel Aquino, Enrique Gil and Martin del Rosario, also starring in the movie are Empress Schuck, Carlo Aquino, Ejay Falcon, Franco Daza, Nico Antonio, Jairus Aquino, Mosang, Richard Quan, with the special participation of Xyriel Manabat and the introduction appearance of Jane Oineza. 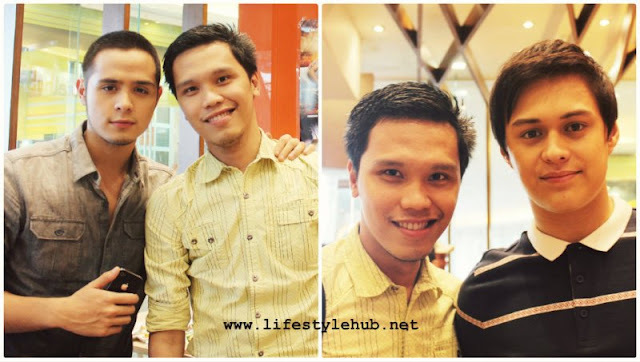 This blogger with the sons of Rosa (Angel Aquino); Amiel (Martin del Rosario) and Rommel (Enrique Gil).